I wanted a space within which movement would create a feeling of freedom, stirring up the senses, and where the exhibit would be a surprise within the movement. We explored 3 Museum Halls, each one full of surprises. In the first Hall, dedicated to the “The Early Christian Church” we discussed the Basilica Plan, and explored aspects of its decoration. Did you know that a lot of provincial Byzantine churches were decorated with interesting floor mosaics and wall paintings, while the more luxurious city churches tended to have marble floors wall mosaics and marble wall revetments? 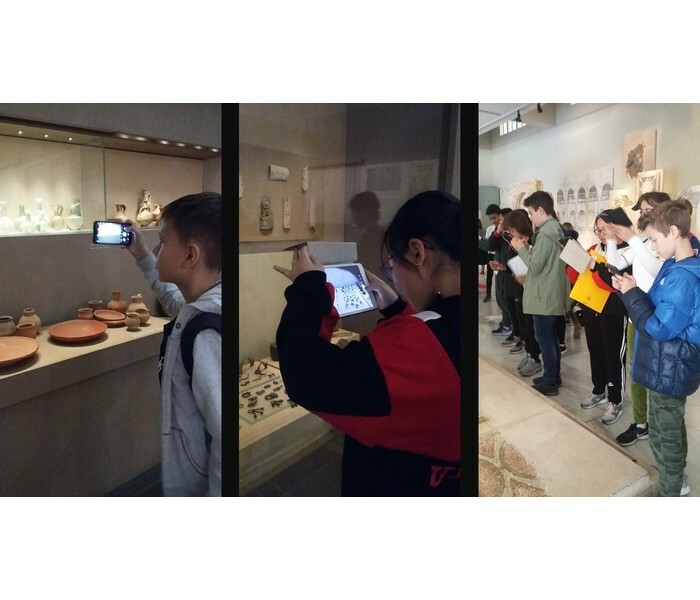 In the second Hall, dedicated to “Early Christian City and Dwelling” our students were surprise by how refined and luxurious life could be during the Early Christian Period. The Hall exhibition, built around a magnificent triclinium, (the reception hall of an expensive house in Thessaloniki) emphasizes the role of an Early Christian city as a fortified, residential complex, stressing different aspects of its private and public life; even “small” things like house equipment and objects for personal adornment. The third Hall is dedicated to the Middle Byzantine Period. An impressive room, full of smaller or greater “treasures”, which gave us a chance to discuss the development of Byzantine Architecture, that is the Cross-In-Square Domed Church. Our students, with their pencils, notebooks and cameras in hand, had a chance to explore, investigate and learn. They were fascinated by the different aspects of the Byzantine Culture, both inside and outside the classroom. Thank you to the museum for having us!